Home/Mariachi Band/Wedding Season Is Here! Mariachi Galore! Everyone loves weddings. Mothers cry, fathers congratulate their sons, aunts and uncles beam with pride, friends and family join in celebration, and in-laws are made. One thing can make or break a good wedding, however. And that one thing is entertainment. So many couples opt to “save” money by hiring a cheap DJ (glorified playlist creator) or pumping in prerecorded music of any kind. What they are missing out on, however, is a live band that can interact with the audience and make the night feel even more special. Our musicians will work with you and your requests for the perfect wedding experience. Whether you or your attending guests and family are of any Hispanic descent or not, a Mariachi group is a great way to throw a wedding everyone will remember. Let the Mariachi music flood your bones and soul and remind you why you love Arizona so much. Arizona is a melting pot of cultures and histories blending together to make one cohesive community—just like your wedding is bringing together a bunch of different people for one beautiful night to honor the bond of two different people making one lovely couple. Wedding planning can be a major headache, especially when working out the budget and how to get everything you (and mostly your wife) wants on this special night. Not only does Mariachi Alegre de Tucson offer the best performers around, but we offer great prices—beating our competitors’ prices every chance we get. You’ll get a great band for an affordable price. If you’re having a church wedding with a special mass, we can perform at the mass as well! If you’re having an outdoor reception, we’re a great option for that as well. Temperatures are rising and an outdoor wedding is a perfect way to spend the afternoon or evening dancing your troubles away. Don’t let faulty audio equipment ruin your day. There is always a risk when using prerecorded music (not counting the risk of a boring party, wink wink) but you don’t have to worry about that with our performers. Projection is important for mariachi groups and many of them don’t need or use microphones and other electronic set ups unless it’s a very large venue, meaning greater savings for the Bride and Groom. Can’t think of a wedding present for your child or close friend? 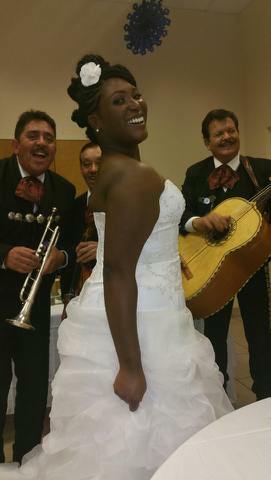 Offer to pay for a Mariachi to perform at their wedding or reception! Bring in a little culture, fun, and excitement to the celebration of a lifetime! No one can say no to the infectious sounds of a Mariachi! So act now for all wedding and other Mariachi needs. The sooner, the better! Our schedules may fill up quickly (but never be afraid to call to try to arrange something a few days before—you might get lucky).